Practice makes perfect for any sport but the equipment you use can also have an impact on your overall technique. That’s why it’s always best to use the best quality practice equipment to improve your game. With regards to golfing, swinging your club can help you get the feel of your stance and the grip on your club. But swinging without a practice golf ball is probably not ideal. Practice golf balls are designed to improve your strikes, aim and your putting action. There are two main types of practice golf balls you can use. Let’s take a look at what they are and how they can improve your technique. Practicing your golf game requires extensive repetition but unfortunately practicing on a golf course isn’t always practical. Real golf balls are heavy and because of this, they can cause a lot of damage when you practice with them in confined spaces. Plastic and foam golf balls are designed to use in limited spaces as they’re light & can’t cause any damage to objects or injure people around you. The difference between plastic golf balls and foam golf balls are the weight, durability, cost & how well they mimic the flight of an actual golf ball. 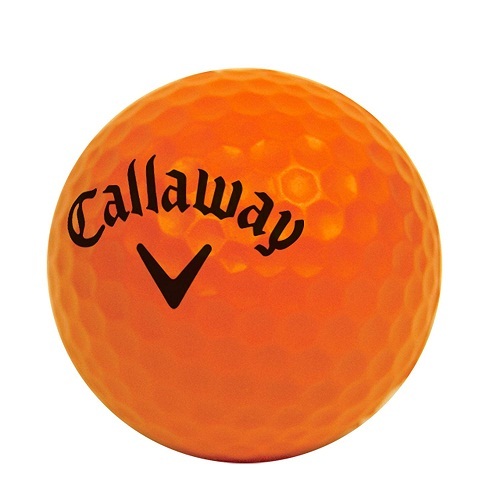 The Callaway HX Practice Golf Balls are made from a durable foam material with hex indents that mimic a real golf ball. They come in bright orange or pink to aid in visibility so you’re able to track them after striking. It’s always good to have a bag to carry your golf balls in. That’s way Callaway gives you a neat mesh carry bag to add simplicity to your golf days. The Callaway HX Practice Golf Balls aid in improving your strikes, putt and aim as they simulate the feel & flight of real golf balls. The PrideSports practice golf balls are made from a durable foam material that comes in a bright yellow design. These practice golf balls have soft indents to aid in flight. 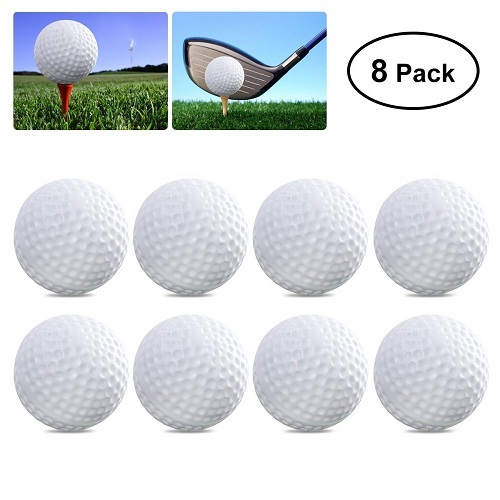 PrideSportspractice golf balls come in packs of 12. 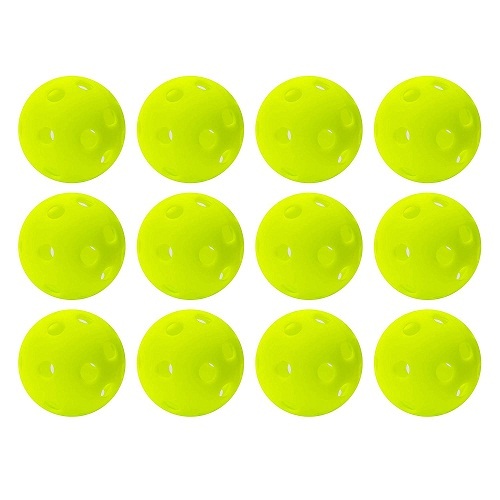 The bright yellow design is to ensure easy visibility and help you keep track of where your practice balls are. They’re durable and can be used in a golf simulator to help you improve your swing technique. PrideSports practice golf balls are soft and light so they won’t cause any damage to objects around you. The Crown Sporting Goods practice golf balls are made from polyurethane that doesn’t crack or break. They’re designed with symmetrical holes to mimic the flight and spin of regular golf balls. These products come in packs of 24. Perfect your swing and shed some strokes off of your gameplay. You’re able to improve your golf stances, strikes and overall technique of your game with these versatile practice golf balls. Take them with you wherever you go to practice whenever you need to. The PrakGolf practice balls are perfect for range practice as well as to help you improve your strikes. You’ll experience zero whiffle incidents with these ones. The practice golf balls have a polyurethane construction for durability and they come in white for improved visibility. They have systematically placed holes to improve flight when you hit the ball. The PrakGolf practice balls come in packs of 30 so you’re able to practice 30 shots before collecting the balls after practicing. They’re durable which means they won’t break easily even after the hardest of strikes. 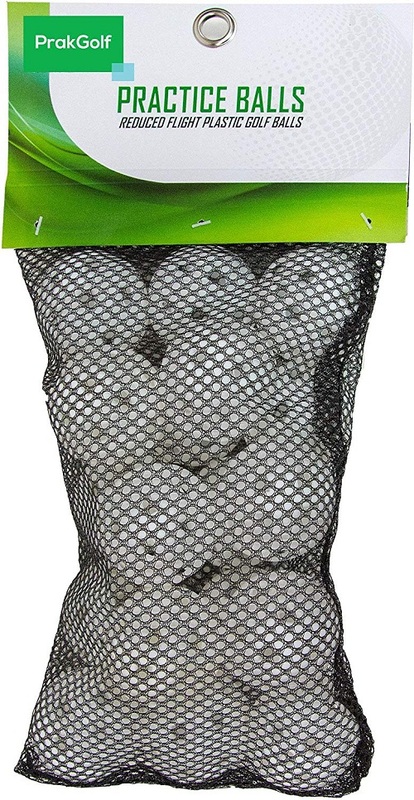 The PrakGolf balls are light and won’teasily damage objects when you’re practicing in a confined space. The Shaun Webb PGA soft practice golf balls are made with soft durable foam. They come in a bright yellow color for easy visibility. The overall indents on the balls ensure flight and speed when you hit the balls, mimicking the feel of real golf balls. This product comes in packs of 12. Shaun Webb PGA practice golf balls can withstand any weather conditions. They’re light and soft but can still reach a range of up to 20 yards. Practicing with these balls will improve your putt and your strike while minimizing the number of strokes you use to hit the ball and reach the hole. The Almost Point3 golf balls are made from dense foam to give some weight to it but they’re soft enough to use indoors. 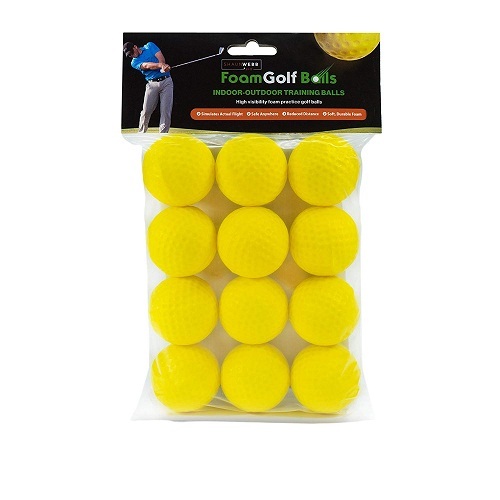 They come in a bright yellow color for easy visibility and they have integrated indents to imitate the feel of real golf balls. It takes a long time for golfers to perfect their putting strokes but using the Almost Point3 Practice balls can make shorter work of it. The balls have draw and spin that mimic the motion of flight of real golf balls. This helps you on your strikes, aim and alignment when hitting the ball. The Franklin Sports practice golf balls are made from durable polyurethane for durability. They come in a bright yellow color for visibility and the symmetric holes are to maximize flight & speed. Practice your golf wherever you go whether it’s on the golf course or in the comfort of your own back yard. The Franklin Sports practice balls help you practice your strikes in confined areas and give you the flight & feel of impact like real golf balls do. 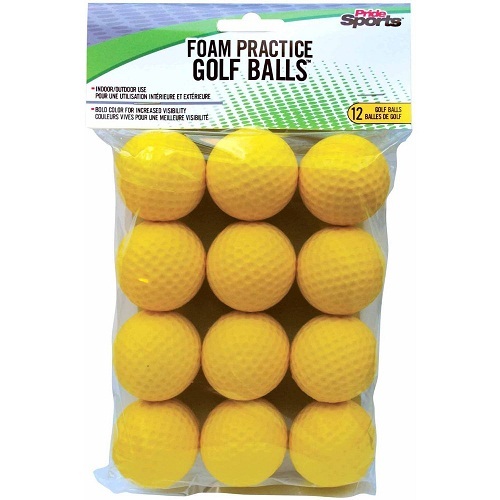 These golf balls are made from light durable polyurethane for durability. They come in a bright yellow colorthat makes them very visible. The balls have holes to maximize flight and speed. The Awakingdemi Airflow practice balls can be used by beginner golfers as well as professionals. They give you the feel of striking an actual golf ball. The balls are designed to improve your strike and your aiming technique. 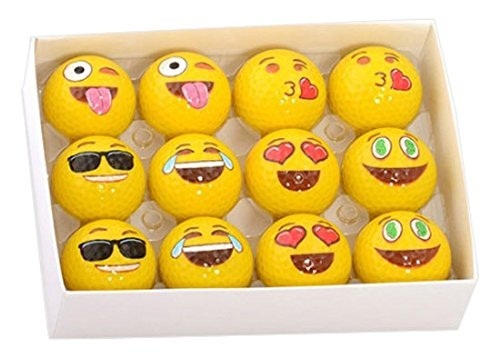 The Emoji Universe practice golf balls come in packs of 12. 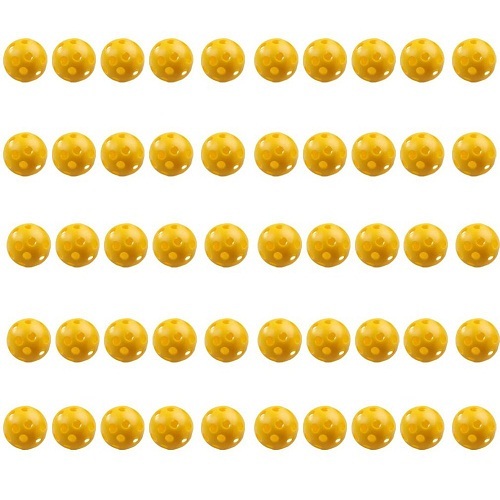 Each ball has a different emoji face designed on the front with a bright yellow background. 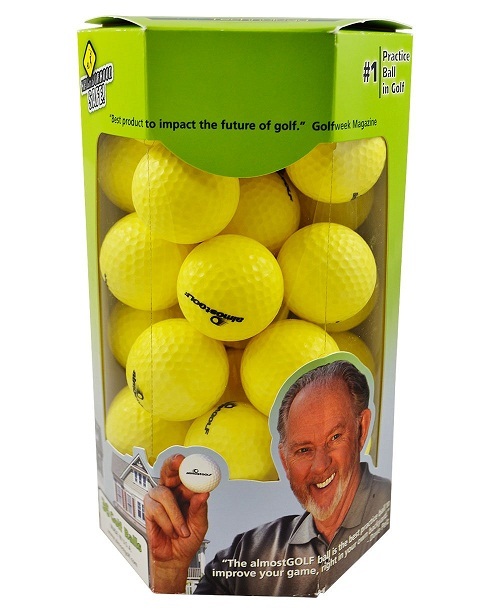 They’re all made from durable hard plastic with overall indents to give you the feel of real golf balls. Play rounds of golf with the balls designed to match your mood. On the practical side, they improve your short game and your long range by helping you with your aim, stance & strokes. These golf balls are made with high-quality plastic that’s durable. 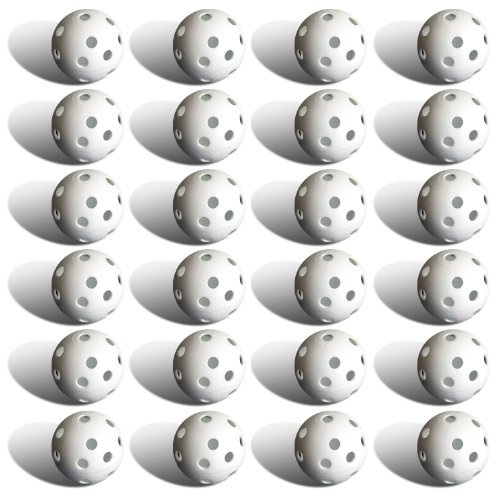 They have indents across the whole surface that resemble the design of real golf balls. The white color makes it easy for you to see them when you’re looking for them after your practice. The ToyMyToy practice golf balls can be used in any weather conditions because of their durable construction. You’re able to practice with these balls anywhere as they’re light and won’t damage objects around you if you practice inside your home. You’re able to improve your golf game with the ToyMyToy as they have the flight, speed and impact feel of real golf balls. Improving your golf game requires a lot of practice as you need to improve your aim, strikes, strokes and stance when you play. Selecting the right practice balls can have an impact on your technique; that’s why we recommend you get the Callaway HX Practice Golf Balls. They’re versatile practice golf balls allowing you to improve putting strokes indoors or maximize the speed of your strikes outdoors. They mimic the flight and speed of actual golf balls allowing you to practice your range effectively. Show all your friends who is boss on the golf course—you simply need to practice the right way.